In the last days of the Great Underground Empire, four of the Empire's greatest Alchemists disappeared into the Forbidden Lands on the day of the Solar Eclipse, supposedly searching for the secret of the Quintessena, the Eternal Life. An imperial spy, Bivotar, was dispatched to locate them. He never returned. Now, the task has fallen onto you. You soon discover that the Alchemists are dead, slain by a horrible demon known only as the Nemesis. You manage to get on the Nemesis' nerves, and soon find yourself allied with the spirits of the dead Alchemists, attempting to finish their work before the Nemesis can finish you. But all is not as it seems, and as you unravel the secrets of the past through old letters and ghostly flashbacks, you begin to realize the full horror of the events which transpired under the Eclipse all those years ago. 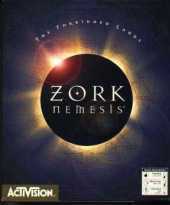 Zork Nemesis is a graphical first person adventure game in the style of Myst or Shivers, mixing logic puzzles with live-action FMV sequences which advance the story. You view each location from a first person perspective, and can rotate 360 degrees to get a full view of your surroundings. It does contain some of the classic humor of the Zork universe, but unlike the other games in the series it has a very dark story and atmosphere with everything ranging from decapitated heads to human sacrifice. If you like horror stories, this one is extremely well done and is disturbingly realistic. The graphics are detailed and realistic, the atmosphere is foreboding and oppressive, and the mood is deadly serious, with eerie sound effects and music. The story is morbid and engrossing, with numerous subplots, and it will keep you guessing until the very end. There is a full hour of dramatic live-action video included, with 14 Hollywood actors, all directed by Joe Napolitano ('The X-Files' and 'Murder One'). It is an unusually long game, with 5 different 'worlds' to visit (Temple, Conservatory, Monastery, Asylum and Castle), any one of which is as long as some other entire games. The complex and absorbing puzzles are logic or mechanical, and are either part of the setting or serve to develop the plot.